If you eat whole foods (as in mostly plants, not the grocery) year round, then it doesn’t take as much creativity to cook on Pesach. In fact, just last night we ate spaghetti squash with marinara sauce and butternut squash soup–all with kosher for Pesach ingredients. So, my best advice on Peasch, for the sake of your wallet, taste buds and stomach, is to eat only foods that you would be willing to eat year round. Forgo the weird substitutes for chometz and cook with normal ingredients, mostly available at your local produce store. Below are a few Pesach essentials that keep us eating normal, affordable and EDIBLE foods. Kosher-brand non dairy creamer is just scary, people. Do your family a favor and don’t touch the stuff. Normally, I use any kind of rice/almond/coconut milk as a dairy milk substitute, but during Pesach the only option is an almond milk with a lot of added sugar and chemicals. It’s not exactly cheap either. My solution? Homemade coconut milk, made from shredded coconut flakes. Just add two parts hot water to one part coconut flakes (unsweetened) and let it sit for a few minutes before straining. I make mine in my coffee French press, and it takes all of 30 seconds to prepare. Forget the margarine. It’s worse than the non dairy creamer. 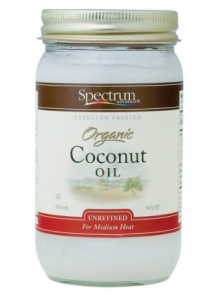 Unrefined Coconut oil from Spectrum is KFP without a special hechsher and it’s worth every penny. Pay now out of your pocket or pay later with your arteries. Get yourself a small cheap processor (mine was under $20), and snack on smoothies and frozen treats all week. We load up on frozen fruit, use it daily and don’t spend a fortune on boxes of popsicles that only contain enough for four people. Because most oil, other than olive oil, is made of soy beans or corn, kosher brands on Pesach get a little creative with cooking oil. Last time I checked, cotton was grown for its, well…cotton, and not for consumption. Look for grape seed oil instead, which is what I use year-round when I don’t want olive oil. You’ve by now heard a lot about quinoa on Pesach. It’s old news. But, that doesn’t mean that most people know what to do with it. Use it as you would rice or cous cous, and you’ll have a filling, healthy meal. Read this post for quinoa recipes and more Pesach ideas. We’re big fans of peanut butter over here, so on Pesach the somewhat expensive nut butters are worth every penny to us. I’ll use them in stir fry sauces and in desserts, like this almond butter ice cream.